"We have understood this since several years ago, but kept silent about it," Hajizadeh was quoted as saying over the weekend in Tehran, adding that Iran enacted counter-measures to mitigate the damage. Iran has been storing its missiles and other munitions in underground bunkers, a method that it says has protected against attacks by the United States and other allies in the region. "They have failed to do a damn thing so far because we have taken their animosity seriously," Hajizadeh was quoted as saying. "Keeping ammunitions in underground tunnels was implemented for the first time in 1984 and we have used this method until today to build and keep different types of missiles." The IRGC leader went on to say that the United States sent damaged industrial parts to Iran as part of the attempt to sabotage its missile program. These efforts fueled a retaliatory attack last week on a U.S. Army Command Center that Tehran has claimed to be a success. 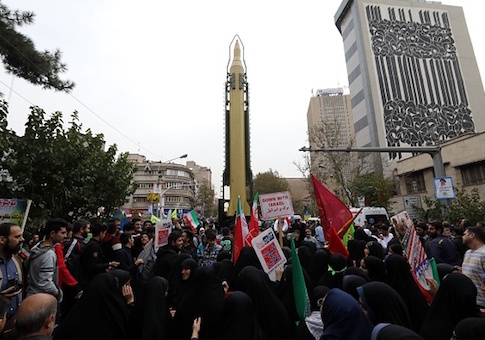 "We stated this issue today because the Americans showed an impertinent behavior and said that they had sent damaged parts to our missile industries," Hajizadeh said. "We did this to tell them that you were not able to attain your goals and instead, we penetrated into your systems and it was a response to the Americans' impudence." Meanwhile, Iran continues to build its sea fleet, a source of much consternation for the United States as Tehran continues to harass American ships and assets in and around the Persian Gulf region. In an example of its latest offensive achievement, Iran unveiled a heavy submarine that it claims can fire anti-ship cruise missiles, weaponry that would mark a large escalation in international waters. "The addition of this semi-heavy submarine will complete the nation's chain of defense in international waters and underwater," Iran's state-controlled IRINN TV announced in a recent broadcast later translated by the Middle East Media Research Institute, or MEMRI. Iranian Defense Minister Amir Hatami hailed the combat submarine as a massive and important contribution to Tehran's military. "Aside from being able to launch torpedoes, this submarine can launch anti-ship cruise missiles from the depths of the sea," Hatami was quoted as saying in the report. "This is the first time this has been done in the country. In addition to serving as an important and influential factor in the defense of the Iranian nation in the framework of the active deterrence policy, this submarine sends an important message to the nations in the region." "The message," he continued, "is that the region has the ability to protect itself without the need for external expansionist powers. These arrogant powers need to take note of recent event and developments and learn a lesson. They must end their intervention, which has caused instability and the shedding of the blood of tens and hundreds of thousands of innocent people in the region. They must allow the nations in the region to choose their own fate."